You have drawn the card bell as your daily psychic Tarot card for overmorrow, Saturday, April 27th 2019. 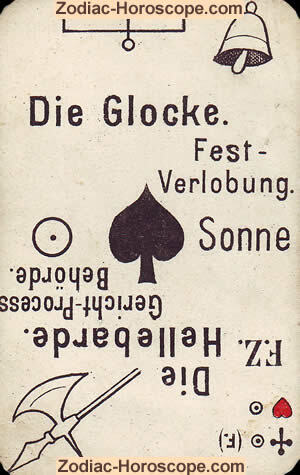 On the lower side of this horoscope card you can see the halberd, which symbolises contact with authorities. It may well be that you are receiving mail from the tax office or from another authority. But this post will either be positive, or you will only financially burden only a little, because the card shows you that the sun shines over your head and put its positive energy on you. The next time is going to be very varied for you. But, the good news first, as it looks that nothing negative or bad will come to you. The bell stands for a feast, for an engagement. This does not mean that you will get engaged, it means that a partnership or a merger will come to your company, which will enable you to continue your professional career.